Here are a couple photos of pit vipers from southern Thailand. These are both wicked fast biters, and I never get close enough to have one tag me. That means I never grab them by the back of the head. I’m not force-feeding them, or removing eye-caps, so I don’t get involved in touching them. I need all the flesh and bone in my fingers because I type a lot on the computer every day. Trimeresurus wagleri. Wagler’s Pit Viper from southern Thailand. 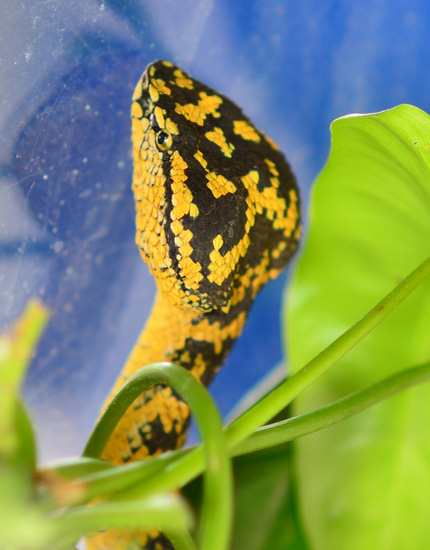 Wagler’s pit vipers have a variety of colors and patterns evident. This one is from Krabi, Thailand. It is gravid, so I’m hoping to get some good photos and videos of the juvi’s when they pop out. Over a month ago one of my friends from a neighboring province in Thailand – Nakhon si Thammarat, wrote me to tell me of some eggs he found and that he was incubating. 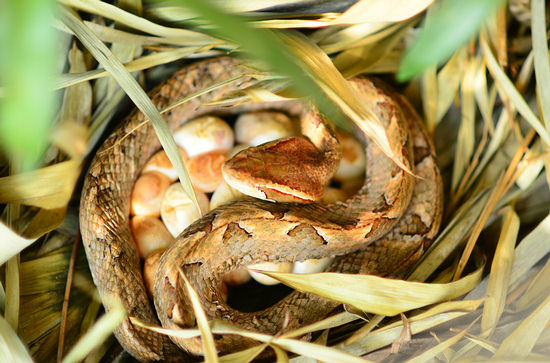 Turns out they were from the Malayan pit viper! He promptly relocated them from inside his house, to out the back door in the forest! Malayan pit vipers do not play nice. They are strong vipers, with exceptionally strong venom. In fact, some state that this snake kills more people in Thailand than any other. The reason, of course, is that Thais and Burmese, Laotian, Khmer, workers in the fields don’t seek immediate treatment at a hospital. If you make it to a hospital – you’ll likely live after a bite. Previous Previous post: June – July – Best Herping Season in Thailand? Next Next post: Are Snakes in Thailand Aggressive?